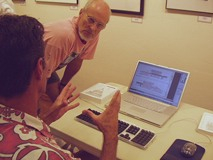 December 15, 2004: SBMUG member and longtime Apple wizard Tonio Loewald of Loewald New Media showed us “How To Write A Mac Application In 10 Minutes (or was that 5? )” using REALbasic, a cross-platform development tool that enables you to make real Macintosh, Linux, or Windows software with drag-and-drop ease. Documentation comes with REALbasic, just press Command-1 to read it. Writing a Macintosh application used to be a daunting task. As easy as Apple makes things for users, that’s how hard it makes things for developers. Using REALbasic, however, Tonio showed us how to make a file browser with list box and “Get Folder…” button. Even with Tonio’s detailed explanations along the way, that took only eight minutes! Other examples were a file renaming utility, and a graphics viewer for creating storyboards from videos and animations. Software functions were refined and “smartened” in REALbasic’s Code Editor window — for example, enabling “drag-and-drop” file open events. ExtremeBasic.com — under development, watch this space! November 18, 2004: We were very fortunate to have a real pro (and SBMUG member) show us one of Apple’s more amazing products, Motion. 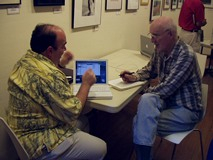 Jeffery Morse, a certified Apple instructor, showed us all the tricks and tools of this great product. 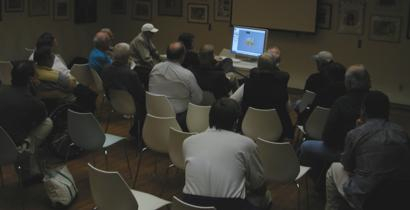 Jeffery Morse demonstrates Apple’s Motion program at the November meeting. Motion is a motion graphics package with real-time previews, procedural behavior animation and Final Cut Pro HD integration. (What does that mean? It means professional quality graphics for video and film. Think Illustrator or Fireworks, but for video.) An extremely important tool in the world of post production. Special thanks to Mike Bishop of Mac Mechanic for providing the blazing fast G5 hardware needed to run Motion. 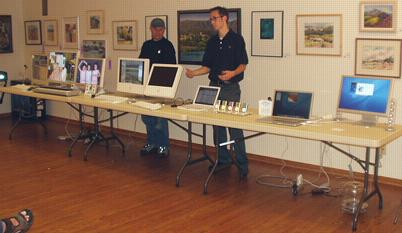 October 20, 2004: This month, local Macintosh dealers showed off the latest Apple hardware. Mike Bishop of MacMechanic and Andrew Heuchert, who sells Macs at CompUSA for Apple, brought along a variety of PowerBooks, iBooks, Apple flat-panel displays, iPods, sound systems and other accessories for us to play with. Another local dealer, Mac Shac, was unable to join us because of schedule conflicts. With our meeting date changed to Wednesday this month, we still had a good turnout. September 16, 2004: SBMUG’s Dale Lowdermilk (who also runs the SBMUG Beginner’s SIG) a lively presentation about eBay, with the best tips and tricks to make sure you can find (and get) what you are looking for. If you like garage sales, you would have loved this presentation! August 19, 2004: Lynda Weinman, renowned author, educator, and president of lynda.com showed us how to stay current with design skills and software training. She discussed the evolution of her company’s training offerings and the pedagogy behind her books, videos, and online offerings, and offered us a free one-day pass to the complete lynda.com library of video titles. lynda.com is a nationally known, highly respected educational and training firm for many types of software, with strong roots in the Mac environment. Harold Adams demonstrates iMovies, iDVD, iTunes, iPhoto, GarageBand. July 15, 2004: This month we tried something new. Instead of one presenter, we had seven! Each presenter had their own table, and we were free to wander from table to table to discover firsthand how these experts use their Macs for work and play. We had so much fun, we’ll probably do it again! Dirk Reynolds (left) and ian lessing (right) play “Unreal Tournament” via an AirPort wireless connection. Patrick Marr explains professional Mac drafting and drawing programs PowerCADD and SketchUP. Robert DeLaurentis giving troubleshooting and general “power user” tips. Brian Carlin shows how to automate your Mac with AppleScript. 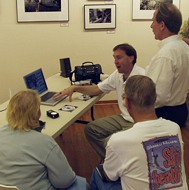 June 17, 2004: Local photographer and photojournalist Dibblee Hoyt gave us a fascinating presentation about digital cameras, storage media, rechargeable batteries, image file formats, and much more — all learned from his own personal experience and “read[ing] the manual”. As a free-lance photojournalist Dibblee has done much international traveling, published articles in national and regional magazines, and contributed regularly to the Santa Barbara Independent. While showing us numerous historical family photos as well as his own, Dibblee brought the tech talk down to the practical level of what works for him, interspersed with stories of the people and places we saw in the photos. Some tips from Dibblee: ¶ 1. “Read the manual.” Take a look at ShortCourses.com, where you can find a better manual for your camera, one that shows you how to take better pictures. ¶ 2. Use an iPod with a memory adapter to store large numbers of images. ¶ 3. With a white card, adjust your camera’s white balance (WB) for the ambient lighting. ¶ 4. Photocopy tables in your camera manual (for white balance, file type characteristics, etc.) and keep them in the camera bag for reference. ¶ 5. Keep extra batteries, chargers, and memory media handy in the camera bag. ¶ 6. Set up a system for organizing your photos so you can select them easily. ¶ 7. Indoors, use an off-camera flash unit and bounce its light off a white ceiling or wall. ¶ 8. Experiment a lot to find out what works and what doesn’t. (Experimenting is cheap with digital photography.) ¶ 9. Learn by looking at photos made by great photographers. ¶ 10. Work on your strengths and do what you like. One other suggestion: Use iPhoto to save a slide show of your images as a QuickTime movie, or use iView Media. 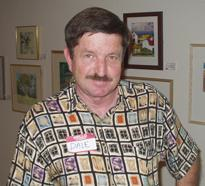 You can see some of Dibblee’s work on “Western Images: Photographs by W. Dibblee Hoyt“. May 27, 2004: Phil Smith, Business Account Manager for FileMaker Inc., gave us a tour of the brand new FileMaker 7. FileMaker is a powerful, easy-to-use work group database solution for solving problems for small businesses to large enterprises. It’s cross-platform, which means it runs on both Macintosh and Windows computers. FileMaker has always been easy to use, but this new release adds unprecedented power that will greatly shorten development time, increase productivity and enhance security. It comes with a generous selection of easily customized templates to get you started quickly. FileMaker easily imports Excel spreadsheets, using column headings for field names if you wish, and third-party solutions and plug-ins are available too. A variety of views make it easy to see and change relationships between tables of information, view data in spreadsheet form, set privileges for viewing and editing fields, link to external files, and set up instant web publishing, and much more. You may want to read PC magazine’s recent FileMaker 7 review. 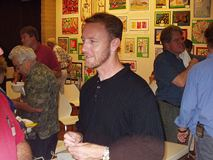 April 15, 2004: Mike Descher returned to SBMUG to show us the wonders of Adobe’s new Creative Suite, which includes new versions of Photoshop, Illustrator, InDesign, and GoLive, as well as Acrobat 6 and Version Cue, which is like a project manager database. Mike, formerly with Apple, is now Adobe’s business development manager for the western US. The Creative Suite’s File Browser is like a light box, displaying thumbnail images of graphics and pages within text documents. The window is divided, into three parts: thumbnail images in the main part of the window, Finder folders, and file comments. Thumbnail images can be rearranged, dragged into different folders, and have their comments edited without leaving the File Browser. Photoshop now makes it very easy to fix problems that used to take a lot of time, such as bringing up the levels in underexposed areas of an image, or stitching together several overlapping images as a panorama. Photoshop now also imports “camera raw data”, which is not limited in pixel resolution. Acrobat 6 can display PDFs containing clickable links, movies and soundtracks, and these PDFs are still printable! Photoshop can save a slide show as an Acrobat 6 PDF, with optional password security. InDesign has all the functionality of its predecessor, PageMaker. Documents can be saved as templates. Photos in documents can be edited without switching to Photoshop. Keyboard shortcuts are customizable and can be printed out for reference. InDesign also can save documents in ISO-standard PDF file types or special types for special purposes. Documents can even contain clickable buttons for a variety of behaviors. March 18, 2004: Dirk Reynolds explained PIM (Personal Information Management), showing us how to synchronize our lists of phone numbers, calendar events, e-mail addresses, and other information on our Macs and all our mobile devices. Sync’ing, or synchronizing, is the process of updating two or more lists of information so the latest data appears in each list, so we don’t have to re-enter the same data in each list. Dirk gave us a tour of useful PIM tools and applications, showed us how to use Apple’s iSync and conduits, and demonstrated some PIM strategies. If you’ve struggled with (or shied away from) synchronizing data between your Mac, the web, and various handheld devices such as iPods, PDAs, and phones, try the Sync Resources listed on our More Info page! February 18, 2004: Donald Burr opened the show with videos and photos of his visit to the Tokyo Apple Store. That wonderful place has four floors of merchandise open to the public, with Macs, iPods, software and accessories, even a Genius Bar, all tastefully designed and laid out. The elevators are beautiful glass boxes; once the doors close, they move in complete silence! 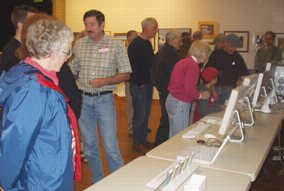 SBMUGers crowd around to watch Harold Adams demonstrate GarageBand with the help of Robert Adams (at right, with guitar). Dirk Reynolds and Harold Adams followed with the main attraction: a presentation of what’s new in Apple’s iLife suite of software, which includes iMovie, iTunes, iPhoto, iDVD, and GarageBand. All the applications work smoothly with each other, and the entire suite is available from the Apple Store for just $49. iTunes with Apple Music Store is now available separately for Windows computers. iDVD can now save two hours of video. iMovie now allows you to pick from a playlist, and menu interfaces with image overlays can be composed by drag-and-drop. iPhoto now works very fast and smoothly even with libraries of thousands of photos. Keywords and ratings (1 to 5) can be assigned to individual images, making it easy to assemble “intelligent libraries” of images based on any combination of keywords, ratings and dates. Ratings can be applied to images while viewing them in slide-show mode. 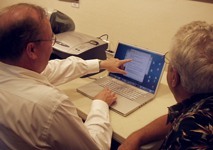 Harold and son Robert demonstrated GarageBand, music editing software with many uses. It comes with more than a thousand professionally recorded riffs for royalty-free use. We heard an original composition by Robert and saw how additional tracks of live music and prerecorded files can be added by drag-and-drop, even copied and pasted into additional places on the timeline. Bob showed us how, while his coffee is brewing in the morning, an AppleScript opens ten web pages in three different web browsers, gets the mail, and begins playing National Public Radio for him. Also, Net News Wire displays headlines from a list of sites without using a browser. Bob also mentioned some inexpensive but useful audio programs, such as iPodRip for synchronizing and recovering songs and playlists, and Audio Hijack for recording sounds in OS X.
Click this link for an outline of Bob’s presentation on his .Mac page.